In our story about Aprilia’s worst kept secret, we told you about the Aprilia Dorsoduro 1200 and its new 1200cc v-twin. Here is the first official photo from Aprilia. The bike is essentially a mega-supermoto with more than 130 horsepower and 85 pounds/feet of torque. Many of the details are in our earlier article (link above) based on a copy of the owner’s manual that had been leaked several months earlier. Expect the final unveiling this Fall at EICMA. So the 750 was not enough, eh …? Maybe it weighs what it weighs because it’s ruggedly built. I’d rather have a machine that isn’t paired down to the last gram of weight. This is great for supersport bikes, but a road going machine needs some extra reserve strength built into it’s parts. If the sum of the parts weighs a little more than the competitors bike, it shouldn’t be considered a failure. That extra weight in the right place can give the bike a more substantial feel, a higher quality of finish, and a better ride. It can be a good thing when it comes to longevity too. Aprilia states “empty weight” 212kg which is 466 lbs (about 530 lbs curb weight full tank). It is reasonable to expect it will feel subjectively lighter than its actual weight, but still, that’s much higher than Ducati specs. At some point the weight penalty and quantity/quality of dealer support is part of the buyer’s purchase decision. Overall, a potential buyer would seem to require a huge overall performance advantage before purchasing something with significantly less dealer support. On another note: manufacturer’s seem wedded to the idea of bikes being either just below or just a little too much relative to the perfect motor displacement. I can only imagine this is purely a marketing trick. The poor buyer of the smaller motor longs for just a bit more and vice versa. It’s the same with dirt bikes. The gap from 250 to 450 just cries out for the perfect 350. One maker (KTM) has a 350, but IIRC it’s only available as a pure race-type MX/SX machine. If the customer was truly king (rather than the marketing/profits bean counters), I’d prefer they abandon the whole load of crap and just build the best performing bike for a specific purpose rather then build to race displacement categories. The only known weakness in my argument is that racing builds better bikes. But they could and possibly should just have one race displacement category. I can imagine all the technology going into one general motor displacement category rather than being split into multiple sizes. State of the art trail, endurdo, and MX bikes, all built within a range of of motor displacement, say 300-400cc. It looks very agile in this video! Nice looking bike, but the 12 more HP than my SV1000N doesn’t make up for the 60+ additional pounds. Technology should be able to make a bike lighter, like the Multistrada! MUCH better looking than that Multistrada thing. I am waiting for the 1200 Shiver. I’ve got 8000 miles on my SL-750 and it’s been a great fun and reliable bike. I didn’t find the price to be out of line with similar Japanese offerings and the maintenance interval is so long (longer than my BMW), I’ve opted to do additional oil changes between the recommended ones! The Aprilia RXV/SXV twins are quite reliable now. I don’t know why people keep complaining based upon the first year model experience. The 2007 models were not even street legal in US and yes there were a lot of engine failures. There have been 2 rounds of significant updates on them. I have the 2009 RXV 550 which runs fine, street and dirt, just need to check/top-off oil periodically. Minor service every 1500 miles, valve/compression check every 6000 miles. Please stop spreading misinformation about these wonderful twins. and “If u want to play u got to pay (timely maintenance intervals sound supervital for this 2 little animals) worse if u have to die on the dealer if u can’t do it yourself. NOT knocking on ur bike at all, actually i like them little Gems (Even had this crazy idea of getting the 550 supermoto for daily hooliganism) BUT im not willing to BEND OVER (LOL) to those rules of engagement. Different courses for different horses. They are great machines but u better know what u getting into.JMHO. But back to regular programing, I think this 1200 Mill will be ANVIL reliable. 130hp out of 1200cc? PPFFFF…not stressed at all. My ancient K3 SV1000N makes a lowly 118hp from 996cc with less compression and it pulls like a Duramax. I wish them well and it adds competition to the market. Aprilia may have some niggling issues but that doesn’t mean they can’t grow. Everyone had to start somewhere and yes, even Honda! I hope they put that engine to a sport tourer and make a new Futura RST 1200! I had a Futura and loved it. It wasn’t without it’s faults, like a lack of a good stock suspension, but I have a feeling that Aprilia would fix that this time around. Was and still is one of the most beautiful bikes ever built. IMO Aprilia has completely failed at their endeavor to crack the USA market. The 450/550 twins as best I can tell need more service than a race 2-stroke single. The motor blew up on virtually every one of the first year models and so did every replacement motor because no changes were made. Parts and service are worse than unacceptable. The dealer network is weak and sparse. How much room is there in the USA for ultra-costly, ultra-temperamental, ultra-low volume, ultra-exotic import vehicles sold exclusively for occasional fun? I respectfully wish they’d just pack it up. Every single manufacturer has released a failure at some point; even and especially Honda. If the 450/550 was a failure that doesn’t tell us anything about the 1200 which shares none of the parts, only the name on the tank. The 450/550 was just asking for me to buy it. A 450 twin! But, yes it is too expensive and too temperamental. Not to mention, in the dirt, it seriously overcomes the tire’s ability to provide traction. Cost of ownership has been tremendous for the 2 people i know that have them. Why all this talk about the 450/550 twins? I have an 02 CapoNord which has carried me over 70K miles now. I’ve regularly changed the oil, tires, chain and sprockets as they’ve worn out and that’s IT. Last time the valves were checked (around 65K miles) they were STILL in spec. I ride year round including torrential rain and 100+ heat. My Capo is very comfortable, has decent power, great luggage, and my friends on sport bikes have to really work hard to get away from me. And if the weather turns bad, I’ll already be drinking my coffee at the next stop before they roll in. If the Dorsoduro 1200 is anything like my Capo but with a lot more power then PLEASE sign me up for one! Had an 04 Falco 20K mile no problems. Now have a 07 Tuono 17 Kmiles and no problems. Oil and filters baby…Oh yeh and back tires..
Definitely aimed more at the Multistrada than at the BMW or Tenere, both of which have shaft drive and bigger gas tanks. This bike, like the Multistrada, is aimed more at sporting “adventure”. 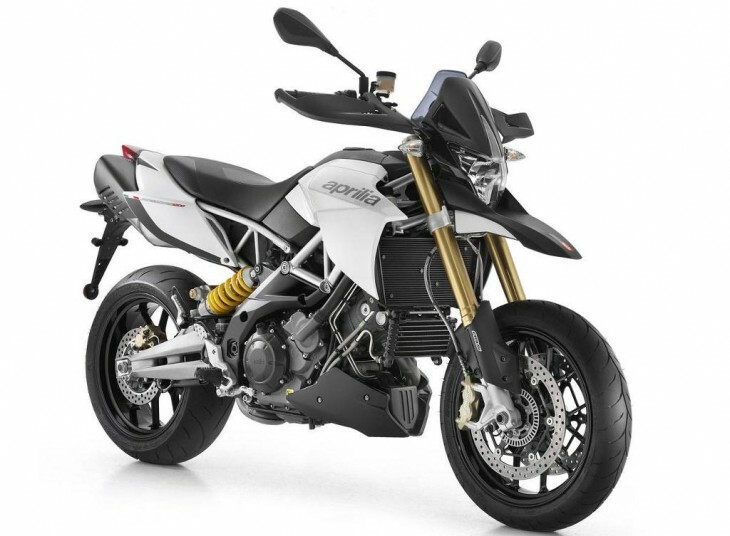 They (Aprilia) have something else coming up to figth the GS1200A and S10, one that fits that segment. Unlike this Mega-SuperMoto wich should go head to head like Dave mentioned with the Ducati Hypermotard and KTM’s SuperMoto R and with some kinda luggage maybe the SuperMoto T…im sure there’s more competitors i left out. Looks like DorsoAlto to me. I think this bike will ship to any market that sells the Ducati Multi Strada/Hyper Motard. everyone is launching a new twin-1200cc standard/moto/adventure/naked bike! We’re reliving the glory days of the 70’s when everyone launched a new 750-four. Great time to be a buying biker! She may be an overweight Piggy, but a good looking one tho. Maybe it handles like is 100 lbs liter once is rolling under its own power. Urban hooligan blaster tool. Why does it have less power than the MultiStrada? 12:1 compression for nothing? P.s: I wan’t to see that S10 beater they have been brewing for a year now with this 1200cc.